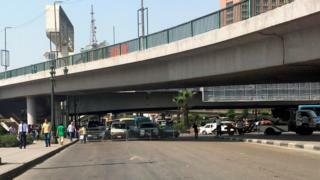 Egyptian security forces have reportedly detained a man suspected of trying to detonate a bomb near the US embassy in the capital, Cairo. A security source said the man was carrying a bag that exploded outside the compound in the Garden City area. The embassy said police had "finished their investigations at the scene" and that it had resumed normal business. Egyptian academic Adel al-Adawy earlier tweeted photos appearing to show a small fire and a man being led away. He wrote that the embassy was "on lockdown after a person reportedly attempted to detonate himself outside the premises". Another witness told Reuters news agency she had heard a blast and then seen a man with a backpack that had caught fire across the road from the embassy. The man was then pushed to the ground by security forces and the fire extinguished, she added. The Garden City area is also the location of the British embassy.